Paul Altieri holds his Rolex Triple Calendar Jean-Claude Killy 6236. The watch is part of a collection of hundreds of timepieces amassed by Mr. Altieri, founder and chief executive of online-trading site Bob’s Watches. Forty years ago, a teenage boy caddying at California’s famed Pebble Beach resort spied a watch lying on the finely shaved green. He traded it to his brother for an 8-track tape. A few years after that he got it back in exchange for his skateboard. Decades later the former caddie sat in a Southern California office building lobby and showed it to Paul Altieri. The collector wrote him a check for $100,000 on the spot. “He was in shock,” says Mr. Altieri, who says the golf-course find was a rare Rolex Triple Calendar, Model 6236, loaded with details known as complications. Mr. Altieri, 60, has built a collection of hundreds of watches, generally finding them one by one. He has also built one of the largest online-watch-trading sites in the U.S., called Bob’s Watches, buying and selling 300 to 400 valuable time pieces a month. 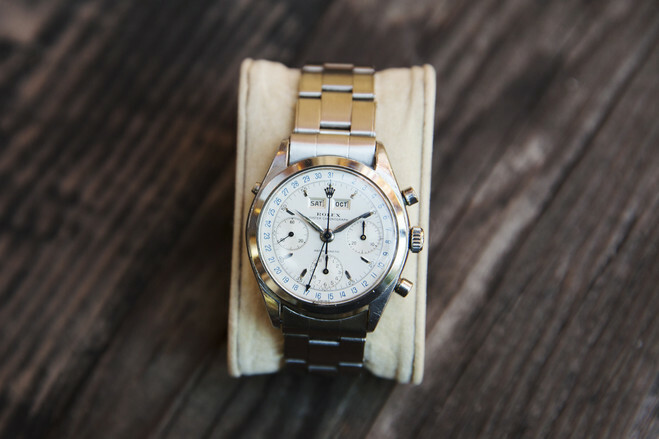 Working from a 5,000-square-foot store in Huntington Beach, Calif., he also collects Patek Philippe, Vacheron Constantin and Cartier watches, but favors the sturdy Rolexes. He can recite the serial numbers of notable time pieces. Watch values vary by rarity, the number of complications and wear and tear. Use reduces the value as bevels get scratched and dials fade. So can polishing, replacement dials or hands. Mr. Altieri advises clients to never polish their watches or replace parts unless it is unavoidable. The rarest watch in Mr. Altieri’s collection is his Rolex Submariner 6200, for which he says he paid $350,000. The collector keeps it in a safe-deposit box. ‘If it was a painting, I could put it up on the wall,’ he says. His own daily watch is a durable Rolex GMT Master known as the Batman for its black and blue coloring. But every once in a while, he pulls out the rarest watch in his collection—a Rolex Submariner 6200 from 1954. It has an oversize crown and has never been polished or repaired and hardly worn. The watch had sat in a safe-deposit box for 60 years, virtually untouched. Mr. Altieri says he paid $350,000 for it. “That’s the most I’ve ever paid for a watch.” Because of its value, he keeps it in his own safe-deposit box, which means the watch has spent its entire existence in bank storage. Some of the collection of vintage Rolex watches owned by Paul Altieri, the founder and chief executive of Bob’s Watches. The online-trading site buys and sells 300 to 400 valuable time pieces a month.